It’s hard to get rid of possessions, even harder to part with those that belonged to a loved one. When Daniel Trauber died of leukemia in 2008, his wife, South Lake Tahoe–based Marianne Rosenfeld, found it an emotional challenge to clear out his old skis. He’d loved the skis, and they brought back so many memories. Unable to part with them, Rosenfeld refashioned the boards into a chair—a piece of functional art to commemorate her late husband. 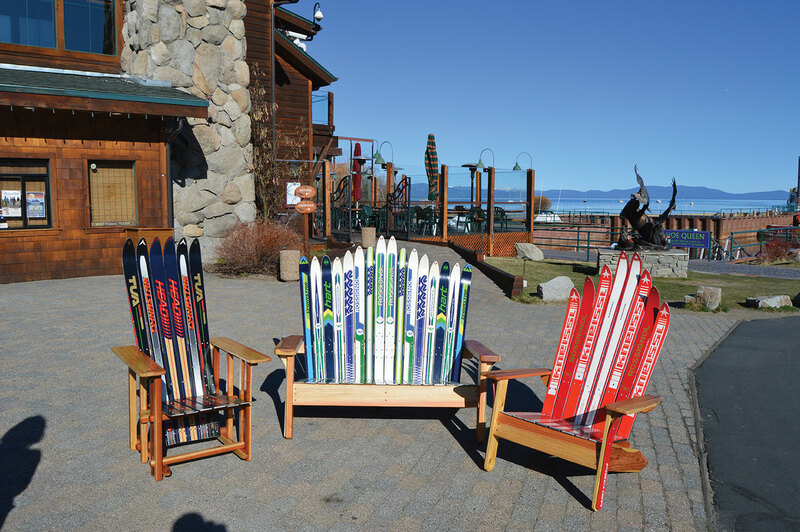 Word spread as friends and family saw the chair, and Rosenfeld began receiving calls and messages from people wanting to commission ski chairs of their own. Four years after Trauber’s death, and inspired by his memory, Rosenfeld quit her fulltime job to found Forest Furniture—and to do what she loved. As a child, Rosenfeld and her family moved a lot. Her father was an aeronautics engineer whose job brought him around the country to companies like Boeing and Lockheed Martin. Her mother was an artist who restored old photographs by hand long before Photoshop, and painted in her free time. The combination of these joint passions for both function and design seem to have manifested in Rosenfeld. She learned woodworking with her father, who trusted her with the saws and other tools that would be so essential later in her career, and together they made projects in his workshop. Rosenfeld attended college at the University of Pittsburgh, where she earned an art degree. In 1980, she moved to South Lake Tahoe, drawn by the outdoor lifestyle. After moving around all her life, she felt like she had finally found home. She got a job as a pit boss at Caesars Tahoe, and remained with the casino as it transitioned to MontBleu Resort Casino & Spa. In her spare time, Rosenfeld dabbled with woodworking, making chairs, tables or whatever else interested her. But it was just a hobby—until her husband died. 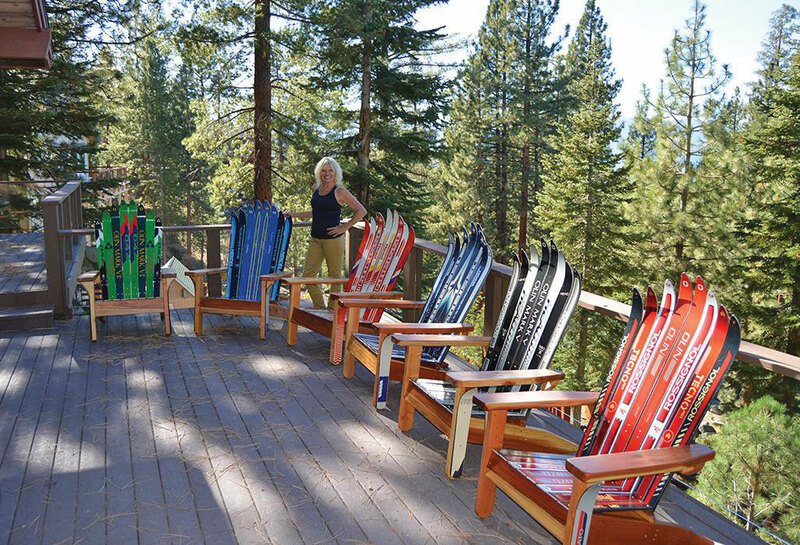 On a bright Sunday in August, Rosenfeld packed up two of her Mission-style ski chairs for delivery to Jim Sanchez, a Reno-based ski instructor at Mt. Rose Ski Tahoe. Sanchez had seen Rosenfeld’s pieces about three years ago at the Reno-Tahoe International Airport. 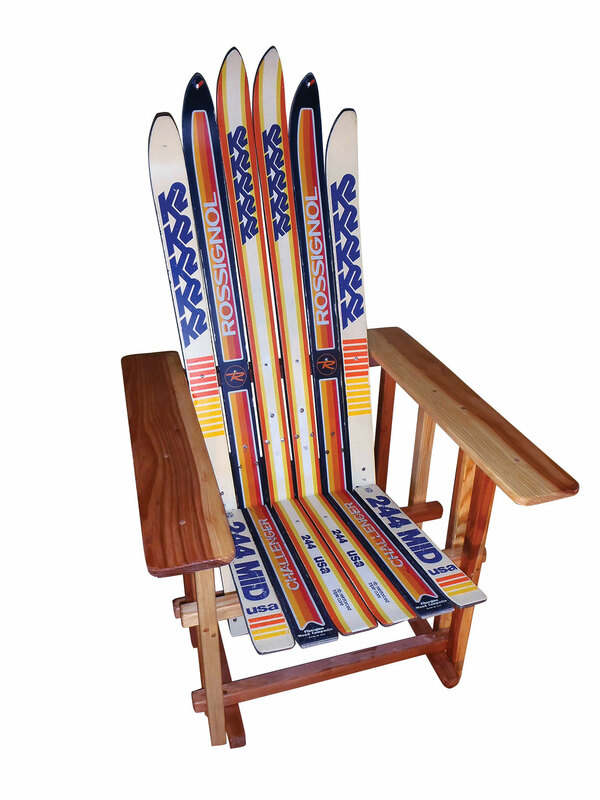 More recently, he contacted her about creating the chairs out of skis he had in his garage. “I had these old skis sitting around forever,” he says. One chair is made of yellow and green Völkl skis; the other is a more subdued palette of mostly white K2s and Rossignols. Rosenfeld points out one of the Rossignol skis that was bent. About 60 percent of Rosenfeld’s clients want to repurpose their own skis, precisely because of the associated memories. “They have a loving relationship with the skis—they were their grandfather’s skis or the first board they learned to ride on,” Rosenfeld says. One client had been skiing on Mt. Tallac when he fell and broke his femur. He had to be airlifted off the mountain. “He never wanted to ride those skis again, but they became a chair,” says Rosenfeld. Sometimes they are a tribute to a deceased relative, as was the case for one of Rosenfeld’s clients who lost her husband to cancer. For clients who don’t have skis to supply, Rosenfeld has plenty of her own—a rotating stock of about 300 skis she keeps at her home, where she works out of her garage. She salvages skis from thrift stores and garage sales. “I don’t go to ski shops because when I ask for old, they say, ‘these are from 2005,’” she says. Rosenfeld has also developed relationships with places like Placerville’s Snowline Hospice, which will save unwanted skis for her. Rosenfeld works with the client to first establish a timeframe for the skis in each particular chair; she likes to keep them within the same decade for a more cohesive look. She’s partial to skis from the 1970s, with the intense orange and blues, but says that for younger clients, skis from the 2000s are retro enough. Clients can choose from four different chair styles—Adirondack, Mission, Sierra and Yeti. Rosenfeld discusses woods and finishes (she prefers using redwood for the blond streaks that run throughout), and determines whether the chair will be used indoors or outdoors so she can apply the correct weather protection. Rosenfeld says you never know what’s on the inside of skis until you cut into them (“It’s like a box of chocolates,” she says). Old Head racing skis have a steel plate between the wood layers, and need a metal blade to cut through. Others, like 1960s-era K2s, are so soft “they’re like butter,” she says, and slicing through them is easy. Once done, she fits the skis to the preassembled wood frames. All told, each chair typically takes about a day and a half to create. Rosenfeld’s furnishings come in many various styles. She’s created chairs and benches from snowboards and waterskis. She makes full-length wine racks from snowboards or smaller, three-bottle versions from skis. One of her most popular offerings is the “brew ski” beer opener, and she’s also repurposed snow gear into coat racks, mirrors and doorknockers. Rosenfeld doesn’t limit herself to ski-inspired furniture; she also designs and builds rustic log furnishings. Pretty, blonde and exuberant, Rosenfeld doesn’t look like the stereotypical chainsaw-toting woodworker—a comment she hears often. Rosenfeld is, however, both the brains and the brawn behind Forest Furniture. An avid hiker and backpacker, she explores Tahoe’s forests, meadows and shores for inspiration, soaking in the water, the branches and, especially, the boulders. The boulders, ubiquitous to both waterline and mountain peaks, make Tahoe unique from other mountainous regions, she says. “I wondered what it would be like to incorporate boulders in the logs,” she says. Real boulders are heavy and hard to work with. Rosenfeld tinkered with designs and various concretes to create a “secret recipe” to make her own boulders. 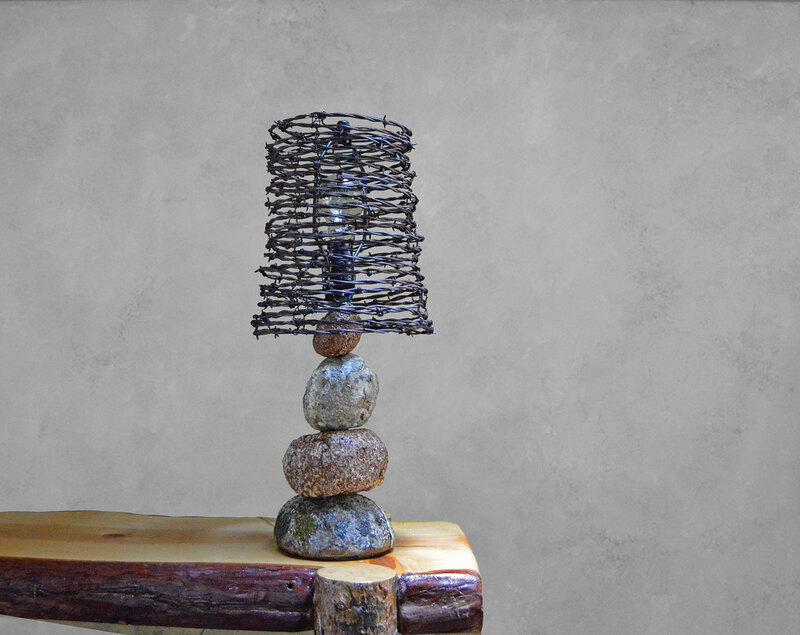 Much lighter than the real thing, Rosenfeld’s granite is shaped by Styrofoam and chicken wire, to create the structure, then she applies her concrete recipe to the outside. Once it dries, she paints features—like lichen and quartz veins—to the rock. It’s then ready to be incorporated into her creations, such as the seat of a chair (as in her popular Daphine series, which combines tall branches and a faux boulder) or the base of a coffee table or table lamp. The mix of boulders and branches, of skis and memories, of going into the forest with her chainsaw and also recreating nature in her garage, allows Rosenfeld to blend her passion for furniture with her passion for snow sports with her passion for the outdoors. Marianne Rosenfeld is the owner of South Lake Tahoe’s Forest Furniture, www.forestfurnituretahoe.com. Select pieces can also be found at Truckee’s Ace Hardware and Spirit Interior Design. Reno-based writer Alison Bender is trying to convince her ski-hoarding husband to make chairs out of the many pairs in the garage.